This package deal contains the UFST02 front stand and the URRS05 rear stand. Both are width adjustable and have proven to be top performers in their categories. Save $64 from buying separately. Call or email with any application questions. 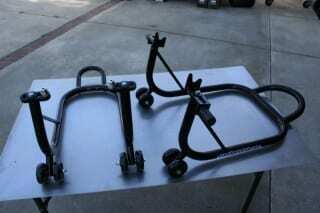 This package deal contains the UFST02 front stand and the BRS01 Rear "Bonneville" stand. Save $59 from buying separately. Call or email with any application questions.